This is the first time my Jewelry has ever been on TV . A few month ago the costume designer for warehouse 13 contacted me to purchase many of my items . I knew that something i made would be on the show but i didn't know what piece or which character would be wearing my Jewelry ! What better Character than Claudia with her Cool style ! I'm so happy i had to share the news with everyone ! Seraphinite (or Serefina), also known by the name Clinochlore, is a common member of the Chlorite Group of minerals. Clinochlore derives its name from the Greek "klino" meaning "oblique" or "inclined" and "chloros" meaning "green" as it is commonly colored deep forest green to green-black with inclusions of silvery Mica. 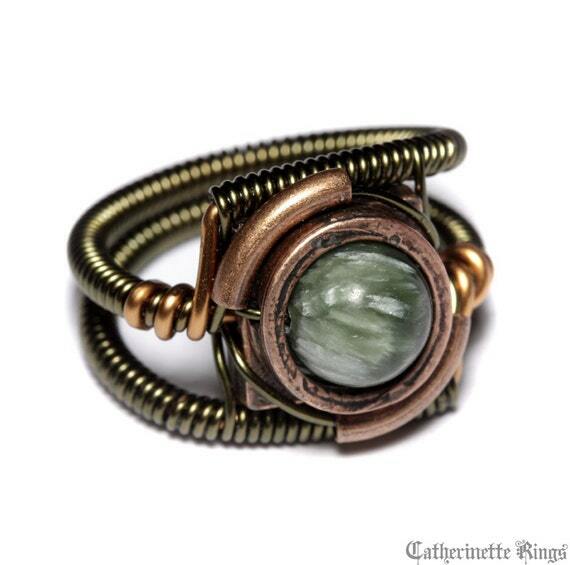 Seraphinite, is derived from the Latin word "seraphin" referring to the first order of angels. The allusion to angels is due to the feathery wing patterns made by the silvery Mica contained within the stone. The Mica inclusions exhibit a chatoyancy and giving Seraphinite a wavery sheen. Often referred to as "an angel stone" due to its feathery look and strong Air to Earth qualities, Seraphinite is said to help facilitate contact and communication with the angels of the highest level. Congratulations that is so cool. I always receive nice comment when I where the ring I got from you. Wow, that is just great. I bet you were thrilled. Congrats! I'm so happy I found your site: the jewelry looks amazing, as do all of your creations. I do believe I'll be visiting often. I also saw you held a writing competition that I missed out on, sadly. Are you planning any others in the future? Thank you again for providing such wonderful creations. I love Warehouse 13 and couldn't think of any jewelry artist who could live up to it- save for you!